In this first real post I want to share some of the informations I have gathered about the armor protection of the T-72 including. 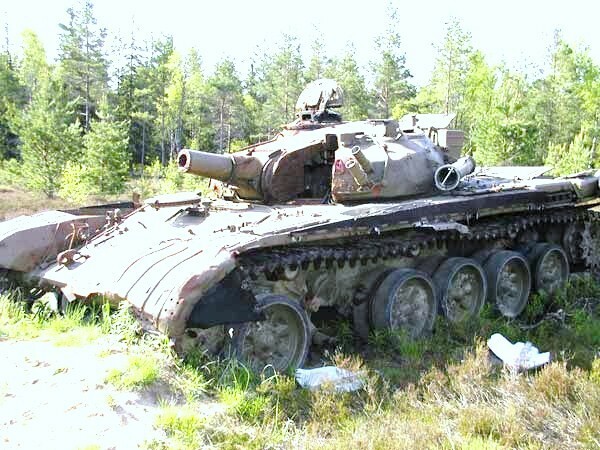 I know that this is no secret - the armor and the estimated protection levels of the T-72 are all well known and can be found in numerous different books. This article will only cover the armor layout of the original T-72 (Object 172M; also known as Ural) and the respective export models Object 172M-E and Object 172M-E1. Follow up articles will probably cover the armor protection of other tanks among them the Soviet T-72A, T-72B and T-80U tanks. The turret of the original production model of the T-72 consisted of cast steel. The turret design follows the typical Soviet turret layout with thick frontal turret armor at the turret center and cheeks, but thin turret sides and rear. The hardness of Soviet Cold War cast steel is said to be about 270 to 286 on the Brinell scale as measured on a T-55 tank (compared to approx. 300 BH for Soviet RHA). Unfortunately I cannot confirm any of this, but due to the person claiming this being rather knowledgeable on Soviet tanks and armor, I assume that this is correct. 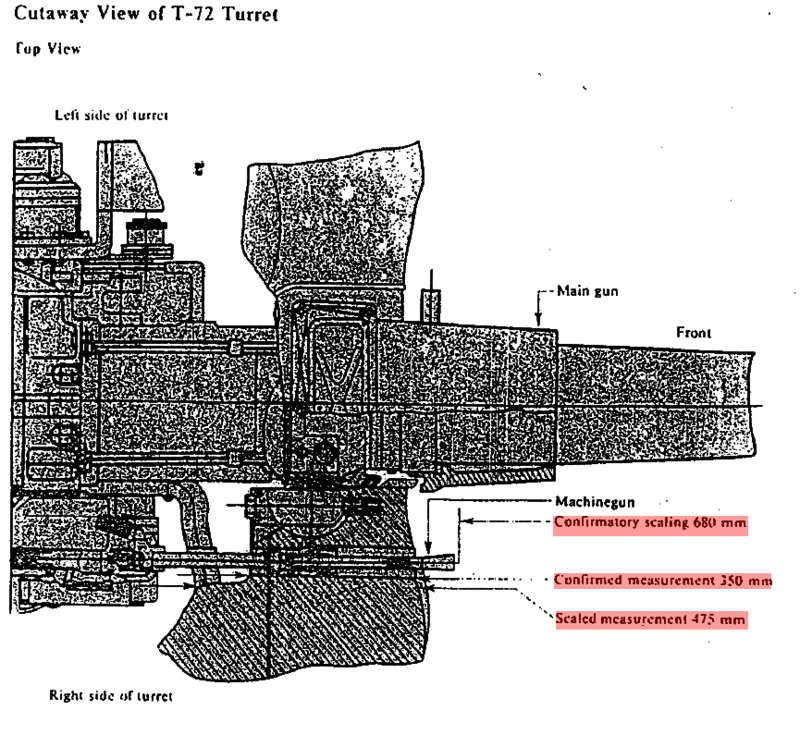 According to declassified documents from the CIA, a measurement of the T-72 turret at the port of the coaxial machine gun revealed an armor thickness of 350 milimetres. Based on a scale-drawing (probably taken from the T-72 manual) the turret armor was estimated to be 475 mm thick at the turret cheeks. This value is backed by the length of the machine gun barrel, which is represented properly scaled in the drawing obtained by the CIA. 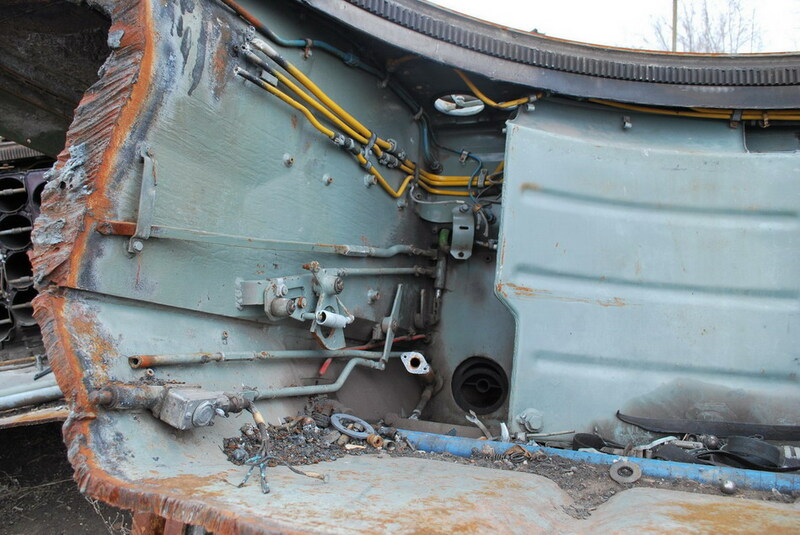 The hull of the T-72 is made from rolled steel plates, which are welded together. The glacis armor is fitted with a new type of multilayer armor, which first was used on the T-64 tank. The rest of the hull armor consists of rolled homogenous steel, which also serves a structural function. Two different types of skirts have been added to the T-72 during the Cold War. The glacis armor array consists of a three or four layer laminate (depending on how one does count a layer). It is identical to the glacis armor of the T-64 main battle tank. The outermost and the innermost layer of the laminate are steel plates, between which stekloplastika is sandwiched. Stekloplastika is a type of glass-reinforced plastic that is a textolite. Why did I speak about three or four layers? Because the glass-reinforced plastic/texolite seems to be always to be evenly distributed in two layers instead of one twice as thick. I was told on a tank-focused web forum that the reason for this is the manfucaturing capacity. 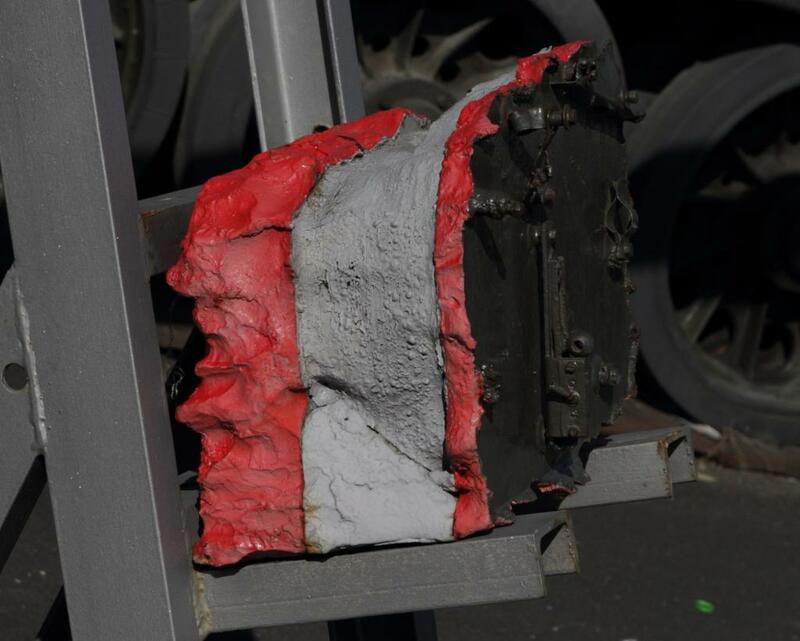 In case of the original T-72 and the early T-64 versions, the outer layer was 80 mm thick, the two texolite had a combined thickness of 105 mm, while the inner steel plate was only 20 mm thick. The whole armor array is sloped at 68° from the vertical - which leads to a line-of-sight thickness of impressive 547 milimetres! The above photograph does not properly reflect the armor layout, as it shows the slightly different armor array of the T-72M1 & Polish PT-91. A more appropriate reflection of the original T-72 glacis array is the shown in the following photograph - unfortunately the slope angle is not correct! The lower hull front is protected by only 80 mm steel at 64° from the vertical. 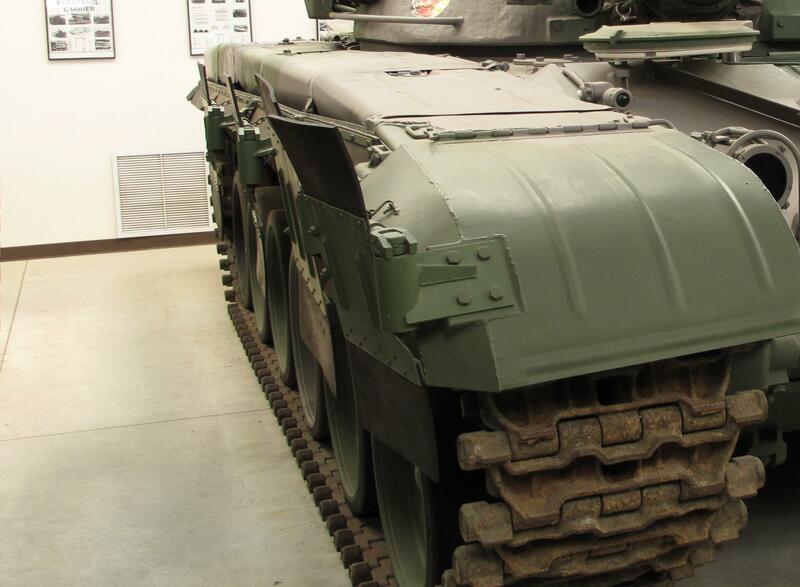 The flanks of the T-72's hull consists of rolled steel plates, which were welded together. 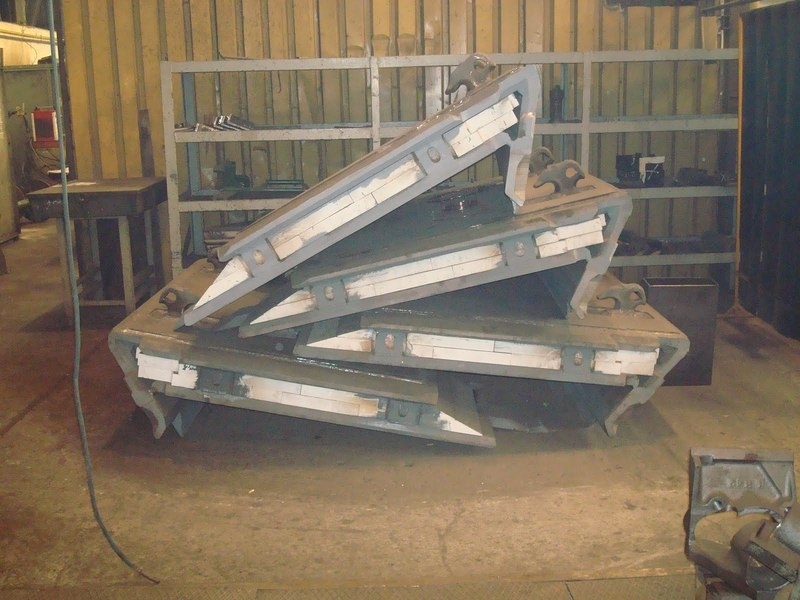 The thickness of the upper plates (covering approximately 60% of the height) is 80 mm, while the lower section is covered by 20 mm thick steel plates at 60° angle from the vertical. The initial product version was fitted with a special type of folding side skirts. The skirts were made of multiple rubber panels, which could be folded to certain angles to provide a higher standoff distance against shaped charge warheads like used by anti-tank guided missiles. However this came at the costs of coverage and these type of side skirts were abandoned in favor of normal steel-reinforced rubber skirts. Visible in the front is the mounting/folding mechanism. The T-72 was initially designed to withstand 105 mm tank ammunition (as used by NATO) from close ranges (500 metres) and anti-tank gudided missiles along the frontal 60° arc. According to CIA estimates the probability to penetrate a T-72 with a M735 APFSDS was 22%, while the TOW missiles was estimated to have a probability between 16 and 48%, depending on how effective the T-72's armor was. Steven Zaloga estimated the T-72 armor to provide protection of 410 mm RHA equivalency against APFSDS and 500 mm against HEAT (see ). In "M1 Abrams vs T-72 Ural" however he does attribute the same tank with a much lower level of protection. There, the turret is said to provide protection equal to 380 mm against APFSDS and 410 mm against HEAT, while the glacis armor is said to provide 335 mm vs APFSDS and 450 mm vs HEAT steel equivalency of protection. The considerable difference between the values has been discussed in different forums, it appears that the values from his later book might be directly taken from a Soviet/Russian report - however this report supposedly is talking about the protection when hit at 60°! According to Rolf Hilmes the turret of a former East-German T-72 had a thickness of only 335 mm sloped between 65 and 80° (I guess from the horizontal). It seems that the turret was cut open at a place close to the coaxial machine gun port, as this is very similar to the CIA measurements. According to Hilmes, the turret provides protection equal to 280-380 mm RHA against APFSDS and 490 mm RHA against HEAT, while the glacis provides 400 mm against APFSDS and 490 mm against HEAT. As the ex-East German T-72 was a T-72M, the glacis armor is improved compared to the T-72. The lower hull is attributed with only 250 mm RHA equivalent protection. Declassified documents from the CIA show an estimated turret armor protection equal to 450 mm RHA against APFSDS and HEAT, while the glacis is attributed with 100 mm less protection against APFSDS. Just like every tank, the T-72 has a number of weakspots due to every tank design being a balance between limiting factors (weight, price) and favorable factors (protection, firepower, mobility). Due to the nature of "modern" special armor, it is not possible to fit every section of the tank with equal armor protection.